Jess Rheinheimer (Manheim, Pa./Lancaster Mennonite) sparked the Eastern Mennonite basketball women to a 72-47 win over Washington College Saturday at home. Igniting an otherwise sluggish offense, she put on a display with a new career high of 41 points as the Royals improve to 8-2 with the non-conference win. Her previous high had been 29 points, which she set in Tuesday’s win at Christopher Newport. The program record for points in a game is 58, set by recent Hall of Honor inductee Emily Mullet in 2001. Rheinheimer also picked up her fourth double double of the season with 10 rebounds. The Shorewomen (4-7) caused fits for EMU’s offense when the two teams met last year in Chestertown, Maryland. 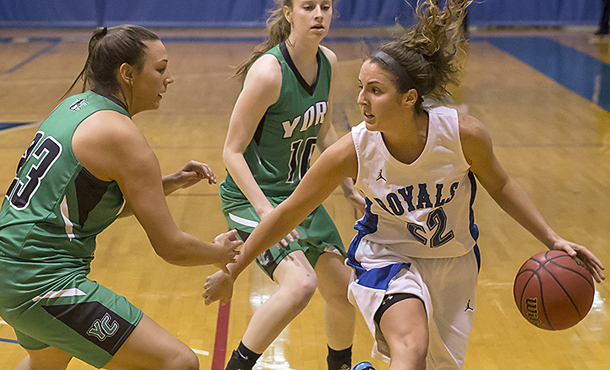 They held the Royals to 34 percent shooting in that game, although Eastern Mennonite still snuck out with a 58-55 win. It looked like the same story was unfolding Saturday afternoon in Harrisonburg as the teams were locked in a low-scoring first half. But defense and Rheinheimer changed the tide in the final minute of the frame. The Royals forced two turnovers and scored the final six to push the lead to 33-25, which was the biggest of the game at that point. Rheinheimer was front and center, hitting a jumper with 26 seconds left before stealing the ball on the defensive end, dribbling across half court and drilling a buzzer-beating three pointer from 40 feet. The momentum carried into the second as Rheinheimer put on a show. The junior hit 10 of her 11 shots in the final half, including a trio of threes, and she dumped in 26 of EMU’s 39 points. Rheinheimer was so dominant that her teammates didn’t score consecutive points until she left the game in the final minutes. The women had a modest 41-to-30 percent advantage in shooting, but picked out a huge edge with 12 steals. Washington had 19 turnovers compared to just eight for EMU. Along with her double double, Rheinheimer tied for the team high with three steals and added two blocked shots. Shakeerah Sykes (Dumfries, Va./Forest Park) scored 11 in the first half and finished with 14 points, seven boards and three steals. Alicia Ygarza (Conestoga, Pa./Penn Manor) added six rebounds, four assists and three steals. Alisa Brown (Dumfries, Va./Forest Park) also had four assists. Emily Hubley led the Shorewomen with 20 points, including 16 of the team’s 22 in the second half. Kelly Sugalski had nine rebounds and six points. After extending their home winning streak to 23 games, the Royals hit the road for two games next week. First up is a Wednesday date at Old Dominion Athletic Conference rival Guilford College. The Quakers have beaten EMU in theconference tournament the past three years. Game time in Greensboro, North Carolina is 6 p.m.